*All yarn overs (yo) are completed by laying the working yarn loosely across the front of the peg, not e-wrapping. 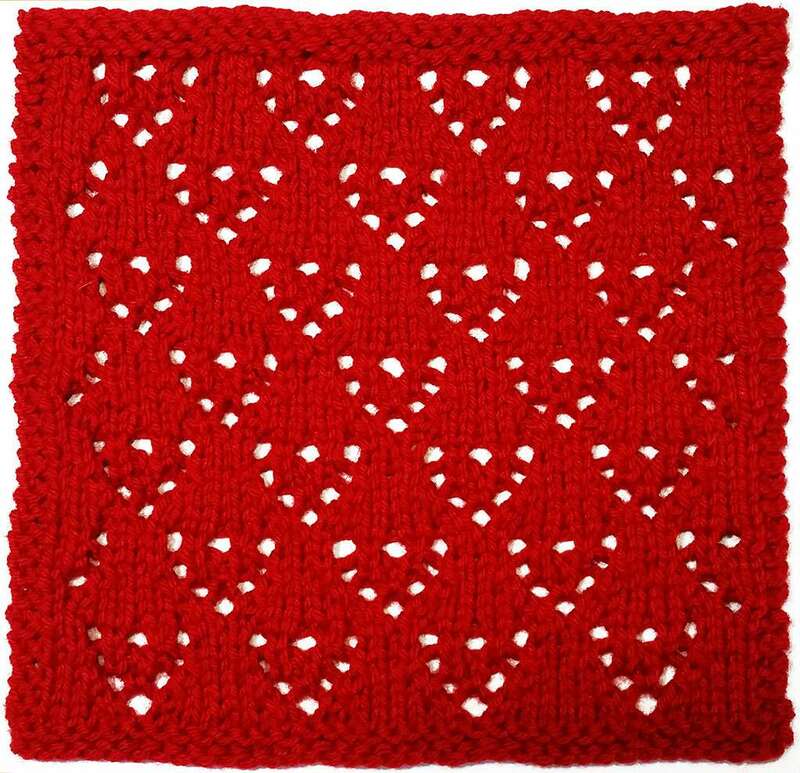 *For ease in reading the directions below, the steps involving yarn overs and eyelets are placed inside brackets [ ] to let you know that they are all accomplished on just two or three pegs. [k2tog, yo]: Worked from right to left. Move the loop from yo peg to the k2tog peg. 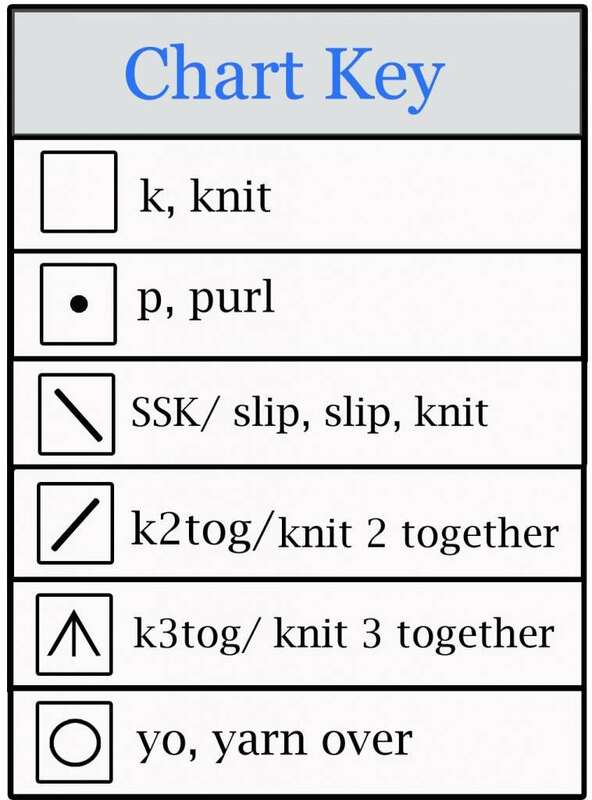 Knit the k2tog peg, working the two bottom loops as one. Loosely carry the WY across the front of the empty yo peg and continue to the next stitch as the pattern dictates. [yo, k3tog, yo]: (As seen in Row 7 of the pattern) Worked from right to left. Move the loops from the yo pegs to the k3tog peg. 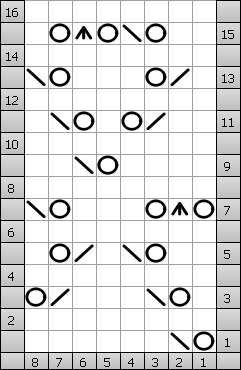 Carry the WY loosely across the first empty yo peg, then work all 3 loops as 1 on the k3tog peg. Carry the WY loosely across the front of the next empty yo peg and work the next stitch as the pattern dictates. Hi Bethany I love this column and am hooked on loom knitting but my previous comment regarding a picture Is just that I want to see the finished product just as you had previously. The video idea is absolutely fantastic and makes the stitches so easy to understand. Thanks so much for this column! You are right…the photo of the square square should also be featured, and it has been added for your convenience. I’m so glad to hear you like the video! I have just taken an interest in loom knitting, can you tell me what that casting on gadget is called so I can get one, and why in some patterns do you skip pegs? How do you decide which pegs to skip? I’m not exactly sure what you mean by “casting on gadget”…do you mean the loom tool/hook that is used to work the stitches on the loom? I use a crochet hook to actually begin the project to add stitches to the loom. Either one of these tools can be found at your local craft stores, and the loom tool can be found at knittingboard.com. There are several reasons why you would skip a peg in a project. One is to create eyelets, which you see demonstrated here in this post. Another is to “slip” a stitch, which is simply to skip it. This is done 1) on the first peg of every row to create a nicely finished chain look on the edges of your knitted item, and 2) in the project itself to cause the loop from the row below to be pulled up and elongated a bit when it is knitted on the row following the row with the slipped stitch. Occasionally a stitch is slipped and the working yarn is actually carried to the front of the knitting instead of the back. This creates an interesting texture in your knitting, with a horizontal line across that slipped stitch in the finished piece.